You are THREE years old today! THREE! I can’t quite believe it, how quickly time has flown by and yet it seems like you were born decades ago, the smell of you as a new born being a distant memory and your learning-to-walk waddle an ancient recollection. Now you run, hop and skip, dancing merrily to “Sleeping Bunnies” and “Bob The Builder” theme songs. You talk, boy do you like to talk! You speak very well in both Gujarati and English, as we encourage you to learn your mother tongue. Your favourite line to tell at the beginning of every request is “Kaale Next Time”, stringing the words together even though they mean the same thing but just in different languages. You are very much aware of conversations around you now, your ears pricking up as soon as you hear words of interest to you. This is making it rather difficult to have adult conversations! Your daddy and I have to spell out words to each other instead. You are potty trained during the day too now, which has it’s own challenges and worries, but at least the worst task of Parenting is over with, right? You enjoy eating, and aren’t insanely picky thank god, but you do so at a snail’s pace, and this can be rather irritating for a time conscious mother like me. You are tall, and so very cute with your dimples as they appear mid-grin. Your phase for throwing tantrums when not wanting to wear certain clothes has thankfully passed too, and currently you are obsessed with wearing “Dhoni Jacket”, the bright blue blazer named after your favourite Indian cricketer. Can’t say I know many kids who beg to wear blazers! Talking of cricketers, we managed our first trip to India, and you absolutely LOVED it, especially the horses on Dahanu beach. You have learnt how to say “Laa ilaaha illallah Muhammadur Rasulullah” (There is no God but Allah and Muhammad (PBUH) is the messenger of Allah) which is the first Kalimah of Islam, and you recite it all by yourself every night before going to sleep. We have also started to encourage you to say short duas for example “Bismillah” when beginning a meal, “Alhumdulillah” after sneezing, or saying “Assalamu alaikum” when greeting loved ones or upon entering the house. You like to pretend to pray the daily prayers beside us, on your own mini prayer mat, mimicking our every move and sujood, even mumbling away under your breath. As much as it is highly comical to see you do it, it makes me so proud at the same time. This does however depend highly on your mood, and most of the time you are happy to carry on racing around the house on your scooter and coming in for a big bear hug once we have finished praying ourselves. You are quite the water baby still, and love to splash in the water, so I think it is about time we get you enrolled in swimming classes so you can do so safely. You enjoy doodling, drawing circles and recognise a number of shapes. You love painting the most, just like your Mummy. You are beginning to sound out the letters in your name and recognise the patterns of the alphabets, but I am in no hurry to teach you just yet. The rat race will begin eventually, so why don’t you stay my baby boy for a little while longer? You are playful, full of laughter and giggles. You have recently discovered your love for ice cream, just as much you like chomping on a plum or sweetcorn. You give long soppy kisses on the cheek and whisper “I Love You” with a smile. You still are a boy’s boy, loving any kind of vehicle with wheels. You experienced your first class of ice skating a while ago and haven’t stopped talking about it since, so by getting you your first pair of roller skates for your birthday today, we hope that passion will continue to grow. You are an individual, with your own thoughts, voicing them loud and clear. You have your own personality, shy but boisterous, and always caring. You are dependent still, wanting us to do it for you. Your laugh echoes contagiously around a room. Your wild side appears as you dangle on the side of a shopping cart or try to perform a stunt. Today, you are three, but there are many more years to come in sha Allah. Many more stories to weave. Many more lessons to be learnt. Many more places to discover. May Allah bless you with many more years, filled with happiness, love and success in both this life and the hereafter. You are three today, but know that Mummy and Daddy have loved you since you were brought into our lives and will carry on doing so for the days, weeks, months, years ahead. You are three, and you will conquer your dreams, just like you have conquered our hearts. 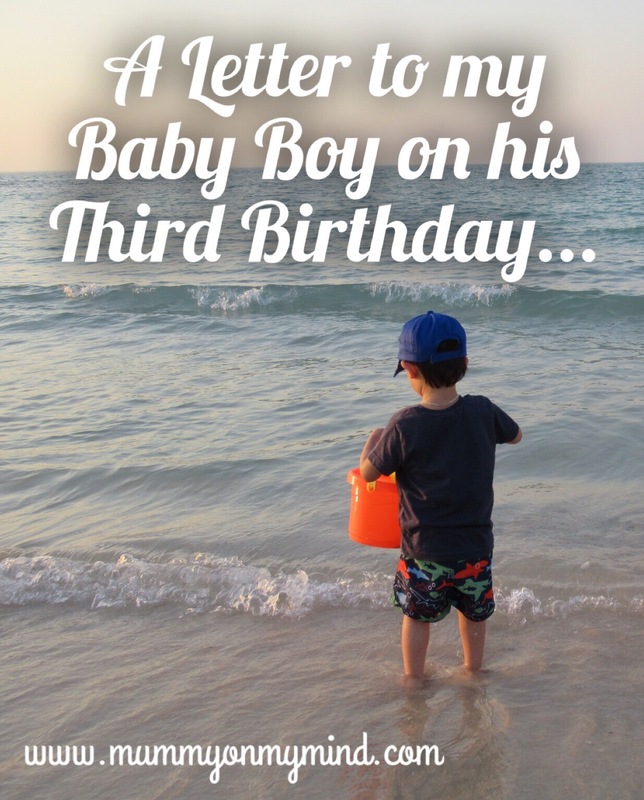 If you are interested, go ahead and read my letter to Master Z on his First Birthday here and Second Birthday here. Happy Birthday Master Z 🙂 you’re such an amazing young boy! Happy birthday master Z. Allah bless you with lots of happiness and love.